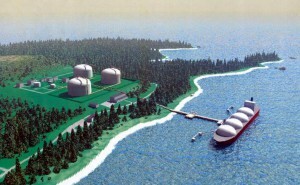 Bear Head LNG is a new liquid natural gas unloading facility located on Canada’s eastern seaboard. HMA designed the facility’s security to satisfy the Maritime Transport Security Act (MTSA) regulations and allow the plant operations to continue while meeting all three of the new Maritime Security (MARSEC) levels. Under direction of the client, HMA’s design makes this facility the most sophisticated security system operating in the vicinity. Some of the technology used at this location includes an integrated radar system, Forward Looking Infra-Red (FLIR) cameras and intelligent video surveillance software to protect the water front, jetty and marine areas, intrusion detection systems with extensive integrated CCTV camera coverage for detection around the site perimeter, state-of-the-art digital video recording, muster reporting facilities and voice communications systems. The site entrance is designed in such a manner as to detect potential unauthorized entry as well as aid vehicle and staff/visitor screening. Equipment in many areas of the facility is explosion-proof to satisfy electrical code requirements.